Intuiface is an interactive displays and applications platform for creating, deploying, measuring, and managing interactive digital experiences. Users can create highly functional multi-touch applications such as presentations, digital signs, information kiosks, point-of-sale installations and more, for any screen and any audience, without coding. Intuiface is a template-free creation platform that allows users to manage their custom content, designs, and workflows, with support for real-time access to data, business logic and devices. Users are able to interact with their audience using any external input device like RFID/NFC tag readers and connected objects among the Internet of Things. Digital signage/interactive touchscreen programs was not even on our radar just a year ago. We create corporate videos for manufacturing clients; about a year ago a client showed our producer what one of their competitors was doing at their trade show booth and said, "They made it with Intuiface; do you think you could make one for us?" After researching the software and deciding that adding this as another service to offer our clients would be a real advantage for us, we took the plunge and bought it. We've since started marketing it to existing clients casually (my producer wanted to give me enough time to get up to speed on the software), and the response has been incredible! Nearly everyone has jumped on board, and has envisioned having us do MULTIPLE projects for them in the future! Learning the software, and understanding how to deploy programs for clients has been a little tough, but it has all been worth it as this is increasingly becoming a larger portion of what our business is now producing. -Coming to this program from a video editing background, I know next to nothing about coding; so glad that this makes it so easy! It has an Adobe feel to it, which helped me feel more comfortable navigating it. -There are lots of pre-made items (buttons, social feeds, parallaxing backgrounds, etc.) that you can download from their library... with a few clicks you can customize it to fit your client's needs, or learn from it so you can create your own items. -They offer free templates for download so you can take a look under the hood and reverse engineer functions that you want for your own projects. -The support is AMAZING. Really! Even though the main HQ is on another continent from me (luckily there is a local office in my country), they are always quick to respond, and courteous too! The support staff will also help guide you in the right direction... and if you want more input, the community board is a friendly, welcoming place to pose questions about best practices for projects. -Coming to this program from a video editing background, I know next to nothing about coding; so glad that this makes it so easy! It has an Adobe feel to it, which helped me feel more comfortable navigating it. -There are lots of pre-made items (buttons, social feeds, parallaxing backgrounds, etc.) that you can download from their library... with a few clicks you can customize it to fit your client's needs, or learn from it so you can create your own items. -They offer free templates for download so you can take a look under the hood and reverse engineer functions that you want for your own projects. -The support is AMAZING. Really! Even though the main HQ is on another continent from me (luckily there is a local office in my country), they are always quick to respond, and courteous too! The support staff will also help guide you in the right direction... and if you want more input, the community board is a friendly, welcoming place to pose questions about best practices for projects. -Having to explain licenses and deployment to clients. Get ready for their eyes to glaze over. -Learning curve is a little steep; there can sometimes be a lot of math to figure out some of the more complex designs that are currently in style, but they have put out a guide that shows how you can build some of the more popular designs. If, however, your client wants a vertical orientation, and the guide is in horizontal orientation, pull out those calculators and start crunching some numbers. Support is fabulous, but I occasionally have to gently remind them that I don't understand the solution as I don't come from a coding background. They then break it down further for me. If you are dedicated and are a natural learner, you CAN learn it! Just be patient with yourself. Overall, Intuiface has helped grow our business A LOT. We've been a design agency for them for years, and they've made us feel like we're part of the family. I've enjoyed getting to know their whole team and being a part of their progress. I'm writing this post because there is a real need for good Intuiface designers who are willing to put in the time to become agency-level professionals. There is a lot of opportunity out there to create real solutions that help people with this software.The thought and planning that went into this software is immense and there are too many things to list. If you're a designer, this will be natural to pick up since the interface is similar to that of an Adobe suite. Here's some things that are fantastic: - API Explorer makes it easy to pull in LIVE data from almost any API. It's unbelievable how easy it is. You can use this to show live feeds, create your own custom CMS, or develop new products. - The software suite is structured for you to have a lot of creative freedom. You're not stuck with some macro-modules that must look and act a certain way. You literally design the look and function you want. - Publishing capabilities allow you to monitor and support a digital signage network if you like. - Collaboration capabilities is very easy within and outside of your organization. - The support is amazing. Nowadays almost every software suite has a tech-forum. Most of the support team has been there for many years, they are very knowledgeable, quick to respond, and often provide great visuals to help solve issues. The thought and planning that went into this software is immense and there are too many things to list. If you're a designer, this will be natural to pick up since the interface is similar to that of an Adobe suite. Here's some things that are fantastic: - API Explorer makes it easy to pull in LIVE data from almost any API. It's unbelievable how easy it is. You can use this to show live feeds, create your own custom CMS, or develop new products. - The software suite is structured for you to have a lot of creative freedom. You're not stuck with some macro-modules that must look and act a certain way. You literally design the look and function you want. - Publishing capabilities allow you to monitor and support a digital signage network if you like. - Collaboration capabilities is very easy within and outside of your organization. - The support is amazing. Nowadays almost every software suite has a tech-forum. Most of the support team has been there for many years, they are very knowledgeable, quick to respond, and often provide great visuals to help solve issues. - I guess the company kind-of totes this software like it's a simple solution for beginners. I'm sure this helps get people to try it, but my opinion is that it's a very robust solution with a steep learning curve. It takes time to get good at it, so keep that in mind. - It's a little difficult to explain the difference in products and licensing to your clients. The ability to create something from a piece of paper and bring it to life with Intuiface with an amazing GUI. The support staff are really friendly and give a clear response to questions which are asked, The support documentation is amazing because it is so easy to find the thing you need when you need it the most. The bad points are responding to the community wishlist's, It seems to take a long time to implement a new features which are suggested by the community. Not being able fix bugs quick enough it usually takes some time to get them fixed. Difficult to create complex navigation schemes he overall product is excellent just needs ironing out in a few areas. - Ease of use and thoughtfully laid out tools, make Intuiface a breeze to pickup quickly and build interactive experiences. - Endless ability with API integration. - Built in design accelerators and the ability to create custom interface assets open up endless options. - Easy publishing capabilities using the Intuiface cloud infrastructure. - Some of the built in tools are limited, however the support team always finds a way to provide a workaround. Target Any Screen Size. Landscape or portrait, single screen or multi-screen display wall, iPad Retina display or Full HD on a Windows PC. Choose whatever is appropriate and specify custom dimensions. Many content types are supported additional to images, videos and documents including 3D models, HTML iFrames and embeds, maps, YouTube videos, Flash animation and audio for voice over and sound effects. Treat all media as interactive. All graphic content is automatically responsive to tap, swipe, pinch and other common touch screen gestures. Intuiface automatically imports Photoshop psd files, converting all labeled layers and groups into png images immediately available for use. Reimport is smart enough to old capture changes. Structure with layers. Unlimited control over the z-axis - that is, the stacking of visual content in and out of the screen. Plus, with experience layers, users can create "master layers" that are optionally visible across all scenes and always onscreen during scene to scene navigation. Below are some frequently asked questions for Intuiface. Q. What type of pricing plans does Intuiface offer? Q. 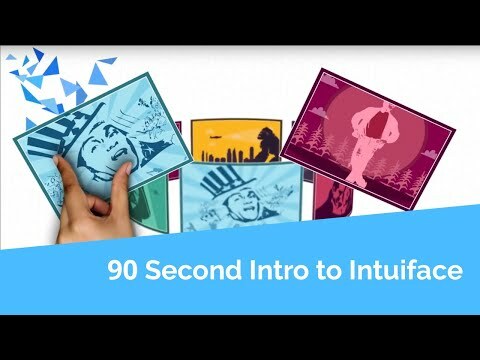 Who are the typical users of Intuiface? Q. What languages does Intuiface support? Q. Does Intuiface support mobile devices? Q. Does Intuiface offer an API? Yes, Intuiface has an API available for use. Q. What other apps does Intuiface integrate with? Q. What level of support does Intuiface offer?